Online readers get it first since we have yet to print and mail it to those who receive in the mail. This issue addresses our most recent overseas mission trip and upcoming plans for the next mission trip. In addition to readjusting to Central Standard Time – an adaptation from nearly two months about 12 time zones away, Bonnie and I are trying to catch up on some of the things at home and in the office that we were unable to do in our absence. We have been attending doctor and dentist visits, too. We were exposed to some diseases while abroad and Bonnie broke a tooth. Bonnie is about over her cough, but mine lingers. Today (Wednesday), she had to go for tests at the local hospital because of something that was discovered in her blood work. We’ll have to wait to see if there is anything there over which to be concerned. My white blood count is elevated, possibly related to an infection associated with my lingering cough. Sunday, November 18, Bonnie and I accepted the invitation to visit the Union, MS Church of Christ for morning worship. Our good friends Therman and Sadie Hodge worship there. There was a fellowship meal at the building following morning worship. It was pleasant to be warming a pew for a change rather than being the speaker. That evening, we worshipped with the Siwell Road Church of Christ in Jackson, MS. This congregation is our sponsoring church. Once more, it was pleasant to feed on the spiritual diet presented by others. We made an appointment for a future presentation about our 2012 mission trips. Monday, Bonnie had some preliminary repair work done on her broken tooth. Afterward, we spent enjoyable hours at a local eatery, talking over sandwiches with Gary Hampton. 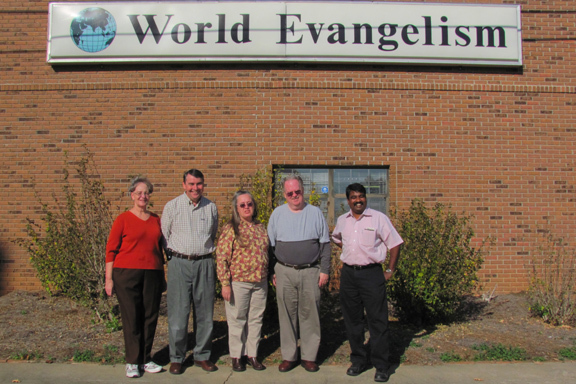 Tuesday, we entertained visitors at the World Evangelism Building. Brethren John Dean Muppidi from India, Therman Hodge and Erving Skinner came to be with us through lunch. Jerry and Paula Bates and Bonnie and I hosted our visitors for homemade lunch. We enjoyed one another’s company, and John Dean brought by some boxes of books for us to ship to India. In addition, he selected books from our warehouse to add to the shipment. We are visiting around and receiving visitors as well since our return last week from 48 days overseas. Shortly, Bonnie and I will resume our traveling and teaching stateside; we are gone about 45 weekends annually – including time in distant lands. Tuesday, November 13 was a day entirely devoted to traveling back to the USA. Our Delhi flight on KLM was airborne about 2:30 a.m. Eight and a half hours later, we landed in Amsterdam, Netherlands; after a layover of four hours, we boarded a Delta flight to Atlanta, GA. We sat together in seating for two along the bulkhead in the tail section of the plane. To our dismay, the entertainment displays on the back of the seats ahead of us did not work, and the service by the aging flight attendants was the worst we can ever recall experiencing. Unfortunately, the long-legged man seated right behind me ceaselessly poked me in the lower back with his knees. That 10 and a half hour leg of our journey back home was painfully longer than it had to be. After a four hour layover in Atlanta, GA, we made the last leg of our air travel back toward home, arriving in Memphis, TN a 7 p.m. CST. Rebecca picked us up and took us to her home, where we will stay until returning to Winona, MS Thursday evening. We had been up for about 44 hours before arriving in Memphis, and we stayed up until bedtime before succumbing to a night’s rest. Admittedly, we fell asleep from time to time in airplanes and cars. For instance, both Bonnie and I fell asleep on the plane from Georgia to Tennessee before the aircraft finished taxing to the runway for taking off, and we did not awake for an hour – within about 20 to 30 minutes of touching down in Memphis. While showing pictures to Rebecca, I fell asleep several times while sitting on the couch between Bonnie and Rebecca; just a little nudge and I would continue the manual slideshow. It is good to be back. We hope that we were of reasonable service to the brethren abroad and in the employ of Jesus Christ our Master. We are thankful to be used, thankful that brethren entrust us with these opportunities, thankful for the spiritual blessings afforded us, and we are thankful for the physical blessings that we routinely enjoy in America. Let us make this journey together from where we are to where we want to be forever with God in heaven. Saturday, November 10 was a travel day. Breakfast consisted of some instant oatmeal served on paper plates in the “Prophet’s Room” of the church building in Kakinada, India, where we lodged for about a week and a half. Lacking sufficient water for even a bucket bath Friday night or Saturday morning, we contented ourselves with a cursory wipe down with some wet ones that we had brought with us from the States. Lunch was served by sister Sudeepa Gootam at the home her husband Ricky and his parents share; she went out of her way to include some definitive American food – namely, French fries – along with some Indian dishes. Finally about an hour and a half past the anticipated departure time for the Rajamundry airport, Ricky, a driver, James Willcutt, and Bonnie and I headed off for our next flight. Not far along, though, Ricky sidelined the driver and took over driving himself because the driver was not moving along the byways fast enough to suit him. Whereas in America drivers typically wait to pass until there is no oncoming traffic, not so in India! Ricky was more willing to play dodgem and risk bumper cars than the driver in order to get all of us to the airport on time. Ricky, in his youthful exuberance, thinks that he is invincible, so it seems. Upon checking in for our flight, we were informed that there was a 20-minute delay, and that we might miss the connection in Hyderabad. Were that to happen, Jet Airways planned to reroute us to Maumbi to take still another flight to arrive Saturday night in New Delhi. However, we were able to make the connecting flight because we were taken from plane to plane across the tarmac. We traded our turboprop conveyance for a jet; though the latter had a jetway by which the other passengers boarded, we climbed the stairs usually the walkway of the aircraft ground crew. We were the last ones aboard, and we had hardly seated ourselves before the plane pushed back and readied for taxing; our carryon luggage was still in the aisle as flight attendants scurried to find places for the bags in overhead bins. That evening, Bonnie and I arrived at the airport that services New Delhi. Four years earlier when we were there, we were disappointed to see poor infrastructure accented with crumbling, dirty surroundings outside at curbside. This time, we found a world-class facility – boasting of itself to have been rated the second best in the world. Like four years ago, our ride was not there yet, but shortly, Vinay David arrived to shuttle us the 45-minutes to an hour to his home in the city. Our phones were not useful to us as phones while we were in Myanmar, but for a steep price, I was able to call brother Vinay to ascertain that he was coming and to inform him where we were standing. Sunday, November 11 was a special day for many reasons. Of course, it was a day that our Lord made, as well as being the Lord’s Day. In addition, this was to be the official opening and first use of the new meetinghouse for the church of Christ with which Sunny and Nargis David, Francis and Elsie David, and Vinay and Arishma David worship and labor. For 40, long years, this congregation had been waiting for its own building. For 10 years, Hindus had contested in the court system the plans of the church to build the building. At last, the building was complete except for some cosmetics inside and out. First, brother Sunny taught Bible class in an upper chamber, and all available space was occupied by local members, members from elsewhere in India as well as by Betty Choate and Bonnie and me. J.C. and Betty Choate were instrumental both in establishing the Lord’s church in New Delhi around 50 years ago and raising much of the funding for the construction of a church building from brethren in the USA. Of course, brother J.C. passed away almost five years ago, but his life’s companion, wife and partner in Christian service was there for the opening of new building – a dream as precious to her as to our Indian brothers and sisters. Between Bible class and worship, Sunny David spoke on the steps leading to the auditorium on the ground floor. He recounted being led to obey the Gospel of Christ by the Choates and the early history of the Lord’s church in New Delhi. Betty Choate was privileged to unveil the plague embedded in the wall adjacent to the entry to the building. The building is modern architecture with clean lines, stylish and yet modest. It is brick outside with cement walls and marbleized floor titles inside. Stately, unpadded and unadorned wooden pews, pulpit and Lord’s Table grace the auditorium. The room was full excepting for some space that could have been obtained on some of the pews by compacting those there sitting, and chairs outside the entrance were occupied, too. The singing was glorious as it resonated off the hard surfaces above, below and off the walls. It sounded as though the angels themselves joined in to bring it to a higher pitch. Worship was decent and in order in keeping with New Testament instruction, and numerous faithful, male members of the church participated in the public facets. It was my honor and privilege to be the speaker for worship that day. While I complemented the local church for achieving this auspicious milestone, I stressed that the meetinghouse was a tool in their hands to better and more effectively serve our King, Jesus Christ, in the days, weeks, months and years that may lie ahead. I stressed that the church is composed of people, Christians – the saved, and that the Lord’s church is not composed of building materials. I encouraged the congregation to train its vision on future, spiritual milestones. Then, I presented my sermon Worshipping Almighty God Acceptably and with Godly Fear. Following worship, the church treated all present to a catered (Indian) meal in the second story classroom. After that, all present sang songs in both English and Hindi for a long time before closing and parting from one another. Though others led singing, too, brother Sunny David appeared to me to be bigger than life as he with much talent, vigor and unabated enthusiasm led song after song forcefully. Monday, November 12 was a day for excursion to the city of Agra to see the Taj Mahal. Brethren are always inquiring of Bonnie and me whether we have seen the Taj, and we always tell them, “No, we are too busy when in India with brethren and non-Christians, too.” This time since we were within about four hours of the site, we immersed ourselves in this part of Indian history – one of the wonders of the ancient world. Bonnie and I, accompanied by Vinay and Arishma David, left about 7:45 a.m. for a four-hour taxi ride to the Taj Mahal. As we paused at an ad hoc site of taxation for travelers along the highway, vendors with a monkey on a rope and cobra in a basket approached the taxi. Agra is neither a convenient site for international travelers nor attractive to Indians from other places in India. The Taj, though, is lovely. It is a tomb for the favorite wife of an ancient Muslim, Mongol King who once ruled in India. The compound has within it a mosque to one side of the Taj and an identical building on the other side of the Taj. Gardens, water pools and fountains, courtyards, raised platforms, guest chambers, and gates contribute to the beauty of the Taj Mahal. It turned out that our guide was in the employ of a shop owner outside the south gate of the Taj. The descendants of the craftsmen who built the Taj Mahal hundreds of years ago live in the same encampment of their forefathers and practice the same skills. We were led into the backroom of a marble shop, where craftsmen fashion marble into exquisite pieces from inlaid plates, boxes to tabletops. It was air conditioned, and the owner had a younger associate buy four cold Pepsi drinks for us. We were experiencing exactly the same thing that sometimes Americans experience stateside respecting vacation home sales pitches in exchange for a free vacation. Although I had no intention of buying anything, and the items for sale were costly, I succumbed and bought a pair of carved marble elephants at close to what I had thought would be the ridiculously low price I suggested as a counter offer. I had to buy two to bring each down to the maximum (really more than) price I thought I could pay for one. Maybe I can find someone who would like to share my good fortune and buy the other elephant from me. Unable to find a convenient restaurant with possibly some international food or in the direction of our travel, and after meandering aimlessly for maybe an hour in the twisted streets of Agra, we launched out for New Delhi by way of a new highway. We made do instead of lunch with cookies or “biscuits,” as Indians evidencing former British influence call them. The latter route between New Delhi and Agra shaved an hour or more off the travel time. It was comparable to an American Interstate in that it was multi-lane and controlled access, but still tractors and other slow traffic is permitted. Two deer-like, more elk-like, animals called Nalgai had made their way on to the thoroughfare’s edge and posed a potential problem. Back in New Delhi, we stopped at McDonald’s for supper. Bonnie and I had chicken burgers, fries and a soft drink. A toy store also caught our attention, and we bought a stuffed bear for Vinay and Arishma’s young child, Aaron. To my dismay, he was more enthralled with pushing a chair around than with the fuzzy toy. We bucket bathed, changed clothes and packed our suitcases. Around 11 p.m., we were in a taxi once more and headed back to the airport. A few early-exploded firecrackers echoed in the streets, signaling the coming of Diwali on Tuesday. 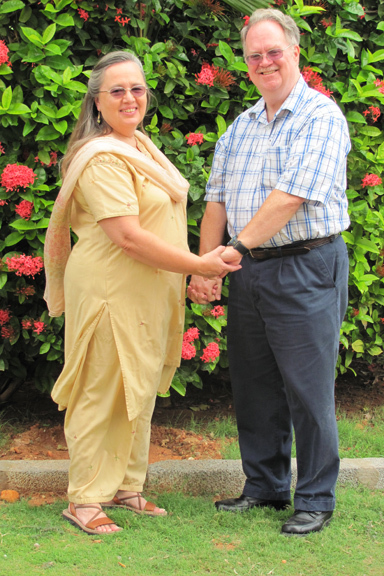 The 2012 Kakinada, India Lectureship occurred Tuesday – Thursday, November 6 – 8. Foreign brethren speaking included in addition to Bonnie and me, James Wilcut, Jim and Elaine Kelly, Therman Hodge, Betty Choate and Vinay David. Funny, though, Vinay is from New Delhi in north India; the brethren in south India still consider him a foreigner, and he spoke in English, and his sermon had to be translated into Telegu (since he speaks not Telegu but Hindi). One young local Indian preacher also spoke once. There was much singing, usually in Telegu, once in Kanada, occasionally in Oria and sometimes in English, too. Tuesday, the program started an hour late due to the difficulty attendees were having getting to Kakinada because of the flooded roads, airports and train tracks. Each day, there were morning, afternoon and evening sessions – running Wednesday and Thursday from 10 a.m. to 9:30 p.m.; Tuesday was about an hour less because of the late start. In the morning and the evening, speakers addressed combined men, women and children, whereas in the afternoons, there were ladies’, children’s and men’s classes. A variety of subjects taught ranged from Male Leadership, Jesus Christ, The All Sufficiency of the Bible, What Is the Mission of the Church, The Role of Women, Sarah, Heaven and many others. Down somewhat from last year due to inclement weather and floods, still the attendance topped 600 – all of whom were fed on premises. Those three days seemed like a week or more given the amount of time devoted to the program. It was good to be there. There was one baptism during the lectureship, which is in keeping with the kind of response one would expect from primarily a Christian audience – many of whom were preachers, elders, other church leaders and their families. Back in the room near day’s end, I was able to publish the November issue of Gospel Gazette Online to the Internet. Contrary to what I had expected during our absence from America, I was able to publish October and November editions at least as timely as I do when I am in the States. Lacking, however, from both issues was the audio lesson by Tim Childs; I doubted whether we could conveniently transmit the longer audio file to and from Asia because of the often questionable availability of sufficient Internet access in the areas in which we were traveling in various nations. I hope to resume in December the audio lesson. Therman Hodge left for the airport following his last speech on Wednesday morning. He was headed home a little ahead of us to be a part of his 50th wedding anniversary on Saturday. Therman was quite anxious since for a while roads, airports and railroads were closed because of flooding. Fortunately, the weather man was wrong (again), and the rains stopped days ahead of predictions, enabling the waters to recede enough to permit his departure on time for home. We made new friends and renewed acquaintances among America brethren – nearly 12 time zones around the world from our usual neighborhoods. As always, we enjoyed greatly spending time with dear Indian brethren who converge on Kakinada for these lectures. All of us have been invited back to next year’s lectures. Another aspect of our relationship with Joshua and Ricky Gootam has to do with the production of literature. We carried funds to leave with them for printing my books on the parables of Christ into one volume in the Telegu language. In addition, we left more money for some of the various and many other literature programs that they promote. Besides the massive literature and Bible distribution for which they are responsible, their TV programs also herald the Gospel throughout India and even as far as the United States. Bonnie and I carefully work with reliable brethren who maintain stable and productive works for the Lord. Friday, November 9, 2012, Bonnie and I along with Jim Kelly and Ricky Gootam traveled an hour and a half from Kakinada south to one last village before Bonnie and I depart for Delhi tomorrow. The village is named Gunna Palli, and the preacher there is Y. Yosapu Raju. I spoke first, followed immediately by brother Kelly. About 50 attended, mostly women. Men are working during the day and unable to attend day sessions many times. Secondly, here as elsewhere in the world, women often are more sensitive to spiritual matters than are men. Afterward, we were treated to typical hospitality before heading back to Kakinada. Bonnie and I are ready on the morrow to put the 2012 Kakinada trip behind us, and we trust that we have been useful in the service of the Lord while here. Sunday, November 4, 2012, Bonnie taught two children’s classes for an hour and a half, while Therman Hodge taught the adult class and I preached for the worship. For lunch, we were taken to a restaurant where we dined with Joshua and Kabita Gootam, Ricky and Sudeepa (plus their son Justin) Gootam, Betty Choate, James Wilcut, Therman Hodge, Vinay David, and Jim and Elaine Kelly. That evening, Bonnie and I along with Jim Kelly, Therman Hodge and Ricky Gootam attempted to go to a night meeting some distance away. However, flood waters from the cyclone that recently battered eastern India prevented us from continuing. Other vehicles, including two buses succumbed to six feet or more water over the road. Monday, November 5, 2012, Joshua Gootam sick-listed me from going to the outstation meetings; Therman Hodge and Jim Kelly accompanied Joshua Gootam on the all-day journey to various villages in which they preached; there were 14 baptisms on this outing alone. Neither Bonnie nor I were feeling well and were medicating ourselves for possibly the early stages of bronchitis. However, Ricky Gootam put us to work preparing giveaways of rice to victims of floodwaters in Kakinada. Bonnie packaged the mix of rice, spices, oil and peanuts. I helped seal the plastic bags using a candle. Later, I helped deliver the first batch to flooded neighborhoods, accessible by walking along the top of a low wall above the flooded street or sloshing through the sewage-contaminated, venetian like canals; I opted for balancing atop the block walls. In the middle of packet preparation, a tanker truck arrived to provide water for cooking rice during the upcoming lectureship. In addition, the next issue of a magazine in the Oria language arrived by auto. Always, dozens of activities are going on simultaneously there. All along, each day I tried to work some on the November issue of Gospel Gazette Online, and I did so parts of these two days as well. The only thing that provided reprieve from more forays into the vast flooded plains to distant villages for outstation meetings was the three-day lectureship slated to begin on Tuesday. Thursday, November 1, 2012, Bonnie, Therman Hodge and I made our way from Visakhapatnam to Kakinada, India; it was a two and a half hour drive. After parting from Samuel, who graciously drove us, we had lunch at the home of Joshua and Kabita Gootam. Lunch over, we headed out to the village of Gorinta, about 45 minutes away. There we found 39 in attendance, 33 of whom were women and young children. Lord’s Day attendance is typically 60 women and 40 men; while we were there, most of the men were working. Thursday was a Hindu holiday during which women are required to stay in the home and cook sweet food for their husbands. However, these Christian sisters opted rather to assemble for a Gospel message, despite the fact that most of their husbands are Hindu. All attending Thursday were converts from Hinduism. The world over, women frequently exhibit a sensitivity for spiritual matters in greater numbers before men; here is no different. Friday, November 2, 2012, Therman and I headed out with Ricky Gootam to a distant mountain, jungle village – over two hours away. Heavy rain overnight, continuing throughout the day, resulted in destroyed sugarcane crops and significant flooding. The little village to which we went is without electricity daily from 10 a.m. to 6 p.m. Therefore, we met in a dark masonry structure with little natural light available because of the storms. Again mostly women comprised the approximately 50 persons present. Therman preached and I exhorted the Christians and Hindus present; three precious souls responded to be baptized. Aside from the residents, the villages and countryside through we which we traveled could have been offered as evidence that we were somewhere in Africa. At the same time, some of the terrain – minus the coconut and banana trees – might have argued that we had driven back to West Virginia. Like many of the days before in our 2012 Asian excursion, we spent an inordinate amount of time traveling by land to remote sites. We were here because Joshua Gootam’s television program introduced the Gospel to people off the beaten path, and several of them subsequently became New Testament Christians. On the way back to Kakinada, we stopped at another especially poor village, much of which is drenched in standing water. We had an abbreviated devotional with about 30 brethren and some Hindus. These Christians, too, were converted from Hinduism. Our activity was curtailed due to inclement weather and the impedance that caused, prolonging our travel time – not to mention rain, floods, darkened skies and no electricity. Upon returning to Kakinada, I bought a plastic table and two plastic chairs to add to the Prophet’s Room in which we are lodging at the church building. It will double as an eating table and a work table; we used it for work first before we ever got around to eating our breakfast upon it. Saturday, November 3, 2012, we woke to another rainy day in India. Three inches of rain fell overnight alone. Consequently, our morning meeting at a village some distance from Kakinada was washed out – literally! A swollen creek washed a bridge away, and there was nowhere dry in the village if we were able to get there. Elsewhere, flooded railroad tracks prevented Vinay David from Delhi arriving on schedule. Another American couple flying in had their flight cancelled due to inclement weather, and they were scurrying to find a flight to any airport within four hours driving distance of Kakinada. Not only are lectureship speakers finding it difficult to travel in view of the cyclone that has buffeted the east coast of India – which storm keeps on giving, but quite possibly the lectureship attendance may be adversely affected, too. Brethren also may have difficulty attending due to poor weather as well as interrupted train and car routes. Some may need to attend to storm damage of their homes, crops and workplaces. The rice crop, which was ready for harvest, has been destroyed by the cyclone. Bonnie and I had some idle time on our hands today. With it we worked on articles for the November issue of Gospel Gazette Online, amused ourselves with some computer games, went shopping and communed with Therman Hodge, Betty Choate and the Gootams. In the evening, we went to a thanksgiving meeting to celebrate the purchase of a home by one of the members of the church; approximately 40 brethren were in attendance. Afterward, we returned to the Gootam’s for supper; Indians eat late supper meals compared to people in the United States. Tomorrow is Bible class and worship with the Satyanani Church of Christ, in which building Bonnie and I are lodging. Monday will be preparation for the upcoming lectureship, and so only a morning outstation meeting is planned about an hour and a half from Kakinada. Otherwise, Bonnie and I will use available time to work on the next issue of Gospel Gazette Online. We never have a reason to be bored as long as we have time to ourselves and access to our mobile office.